We are a family of 5 that wants to contribute to improve the world by actively promoting positive attitude, for a better future. María is from the south of Spain, she loves talking and having a “human connection” with other people, practising yoga and spending time with family and friends. 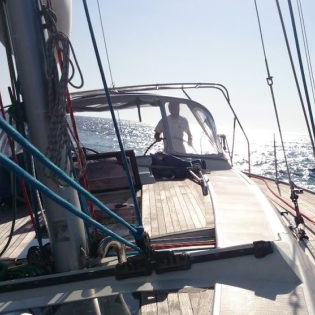 Pierre-Olivier (po) is from France, sailing is his passion, he is a natural geek, he enjoys spending time improving life on-board, fixing things that are broken, breaking things that work. We met in 2000 when María was studying in France. We have been living in 3 different locations in France. There, we made a lot of friends now located all over the world. We have 3 (4?) lovely kids that keep us extremely busy and proud. Marcos was born in 2007 ; he loves reading and inventing things, he dreams of sailing the Vendée Globe. Lucía was born in 2009 ; she loves dancing and she dreams of being a ballerina. Yago was born in 2010 ; he loves rugby, fencing and cooking. … and Soledad was built in 2008 in Greifswald, she is a Hanse 430e (#192 in the series). She became part of the family in 2013. We are looking forward to meeting you and to sharing our passions with you.